Deshyin Shekpa (Tib. དེ་བཞིན་གཤེགས་པ་, Wyl. 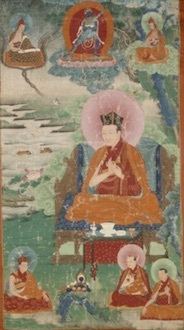 de bzhin gshegs pa) (1384-1415) — the Fifth Karmapa. He was offered a physical Vajra Crown by the Yong Le Emperor of China, which has been used in the Vajra Crown Ceremony ever since. This page was last edited on 6 June 2018, at 06:13.